Frenkel exciton – The time dependence of the internal structure of the charge-transfer exciton in LiF, created by an idealized point source (represented by the wavy line). The absence of significant structural changes indicates that the relative motion of the electron and hole is frozen, which demonstrates that this is a Frenkel exciton. Credit: Peter Abbamonte, University of Illinois, Urbana-Champaign. An exciton can form when a photon is absorbed by a semiconductor. This excites an electron from the valence band into the conduction band. In turn, this leaves behind a positively-charged electron hole (an abstraction for the location from which an electron was moved). The electron in the conduction band is then effectively attracted to this localized hole by the repulsive Coulomb forces from large numbers of electrons surrounding the hole and excited electron. This attraction provides a stabilizing energy balance. Consequently, the exciton has slightly less energy than the unbound electron and hole. The wavefunction of the bound state is said to be hydrogenic, an exotic atom state akin to that of a hydrogen atom. However, the binding energy is much smaller and the particle's size much larger than a hydrogen atom. This is because of both the screening of the Coulomb force by other electrons in the semiconductor (i.e., its dielectric constant), and the small effective masses of the excited electron and hole. The recombination of the electron and hole, i.e. 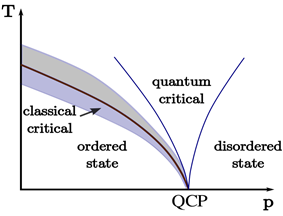 the decay of the exciton, is limited by resonance stabilization due to the overlap of the electron and hole wave functions, resulting in an extended lifetime for the exciton. Excitons may be treated in two limiting cases, depending on the properties of the material in question. In materials with a small anthracene and tetracene. In semiconductors, the dielectric constant is generally large. Consequently, electric field screening tends to reduce the Coulomb interaction between electrons and holes. The result is a Wannier exciton, which has a radius larger than the lattice spacing. As a result, the effect of the lattice potential can be incorporated into the effective masses of the electron and hole. Likewise, because of the lower masses and the screened Coulomb interaction, the binding energy is usually much less than that of a hydrogen atom, typically on the order of 0.01eV. This type of exciton was named for Gregory Wannier and Nevill Francis Mott. Wannier-Mott excitons are typically found in semiconductor crystals with small energy gaps and high dielectric constants, but have also been identified in liquids, such as liquid xenon. In single-wall carbon nanotubes, excitons have both Wannier-Mott and Frenkel character. This is due to the nature of the Coulomb interaction between electrons and holes in one-dimension. The dielectric function of the nanotube itself is large enough to allow for the spatial extent of the wave function to extend over a few to several nanometers along the tube axis, while poor screening in the vacuum or dielectric environment outside of the nanotube allows for large (0.4 to 1.0eV) binding energies. Often there is more than one band to choose from for the electron and the hole leading to different types of excitons in the same material. Even high-lying bands can be effective as femtosecond two-photon experiments have shown. At cryogenic temperatures, many higher excitonic levels can be observed approaching the edge of the band, forming a series of spectral absorption lines that are in principle similar to hydrogen spectral series. At surfaces it is possible for so called image states to occur, where the hole is inside the solid and the electron is in the vacuum. These electron-hole pairs can only move along the surface. Alternatively, an exciton may be an excited state of an atom, ion, or molecule, the excitation wandering from one cell of the lattice to another. When a molecule absorbs a quantum of energy that corresponds to a transition from one molecular orbital to another molecular orbital, the resulting electronic excited state is also properly described as an exciton. An electron is said to be found in the lowest unoccupied orbital and an electron hole in the highest occupied molecular orbital, and since they are found within the same molecular orbital manifold, the electron-hole state is said to be bound. 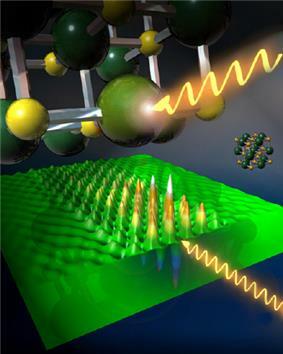 Molecular excitons typically have characteristic lifetimes on the order of nanoseconds, after which the ground electronic state is restored and the molecule undergoes photon or phonon emission. Molecular excitons have several interesting properties, one of which is energy transfer (see Förster resonance energy transfer) whereby if a molecular exciton has proper energetic matching to a second molecule's spectral absorbance, then an exciton may transfer (hop) from one molecule to another. The process is strongly dependent on intermolecular distance between the species in solution, and so the process has found application in sensing and molecular rulers. Excitons are the main mechanism for light emission in semiconductors at low temperature (when the characteristic thermal energy kT is less than the exciton binding energy), replacing the free electron-hole recombination at higher temperatures. When excitons interact with photons a so-called polariton (also exciton-polariton) is formed. These excitons are sometimes referred to as dressed excitons. Provided the interaction is attractive, an exciton can bind with other excitons to form a biexciton, analogous to a dihydrogen molecule. If a large density of excitons is created in a material, they can interact with one another to form an electron-hole liquid, a state observed in k-space indirect semiconductors. Additionally, excitons are integer-spin particles obeying Bose statistics in the low-density limit. In some systems, where the interactions are repulsive, a Bose–Einstein condensed state is predicted to be the ground state. ^ Liang, W Y (1970). "Excitons". Physics Education 5 (4): 226. ^ Frenkel, J. (1931). "On the Transformation of light into Heat in Solids. I". Physical Review 37: 17. ^ Wannier, Gregory (1937). "The Structure of Electronic Excitation Levels in Insulating Crystals". Physical Review 52 (3): 191.